Harajuku student wearing a resale button down uniform shirt, cropped khaki pants, black sneakers, a canvas tote bag, and sunglasses. Harajuku girls in anime-inspired fashion including a winged sailor collar jacket, a Love Live! kimono jacket, platform sandals, and kawaii accessories. Harajuku girl in a red fringe resale dress with a blue bomber jacket, colored rights, and creepers. 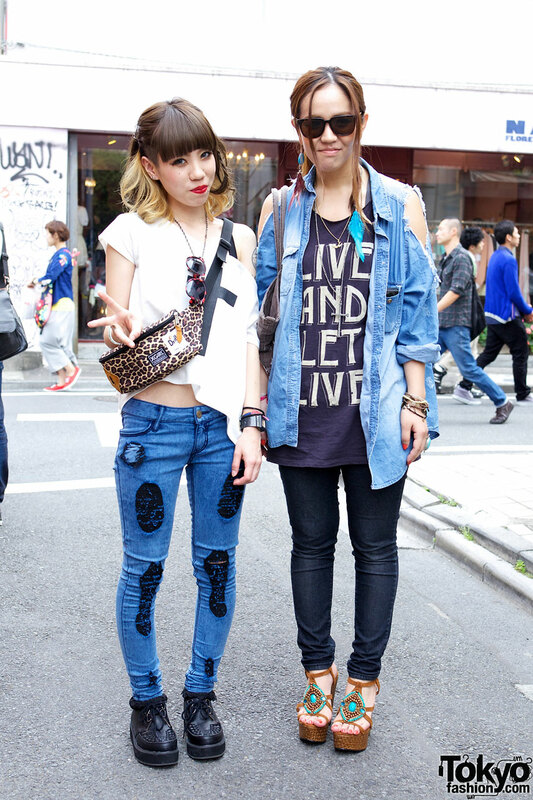 Tattooed girl in patched Gyda jeans and friend in WC by Wakatsuki Chinatsu denim shirt and long feather earrings. A report – with 300 exclusive pictures of cute, colorful & kawaii runway fashion shows – from the 2012 Spring/Summer edition of Tokyo Girls Collection. Over 25,000 girls attended the event!